My service is on a Reward basis, you only pay if the item is found. If I have to drive more then a 1/2 hour to get to you, there will be a call out fee of $25. to cover my gas expenses if your ring is not found. Hi there! My name is Mike McInroe and I'm 53 years young! Married 29 years with 3 children. I love God, my family, my country, metal detecting, soccer and the great outdoors! I've been metal detecting for 13 years and have always loved the excitement of finding lost things. Chris Turners Ring Finders is exactly the kind of thing I have been wanting to do in my own community--help others find their lost treasures!! My name is Rod. I, after bathing my dog in the yard , discovered that my wedding band was missing . Having been married for 43 years , I was very disappointed to lose it & searched frantically with the help of about 10 friends for 6 days without success. Fortunately, a kind neighbor knocked at our door & gave us Mike’s name & address. I called him. An appointment to initiate the search was made & at which time Mike arrived promptly. After marking off the area ,he was able to locate & retrieve the ring within approximately 5 min of initiating task at hand. My wife & I are so pleased & grateful . Let me tell you, if you ever loose a ring or jewelry, do not hesitate to call Mike. Calm, cool, and collected, he answered my SOS call ASAP, set a time, and showed up with professional equipment to find the two rings. 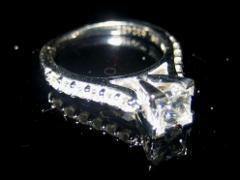 I am extremely grateful to him and the ring finder web site. Thank you so much for the time and effort you spent locating and finding my wedding band. It's sentimental value after 44 years of marriage means allot to me! Enclosed is a token of my appreciation for costs and for mailing. Again, I deeply appreciate your kindness! Thank you for your help finding my ring. This without a doubt is a topic of conversation. So many people are amazed that this service is available. I may not have given you a testimony right away. However, between my wife and myself we have told many people. I am still amazed that you found my ring after our entire soccer team, parents included looked for several hours during the pool party between games. The entire team is having a difficult time believing that the ring flew as far as it did. You should post the picture of where you found it online. Thanks again! I can’t relay how much this means to have my original wedding ring. I wanted to reach out to let you guys know how grateful I am for Mike McInroe! What a blessing he is. 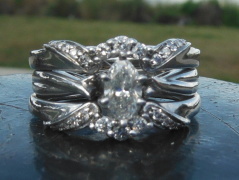 Our lost ring story begins 33 years ago when my mother was pregnant with me. 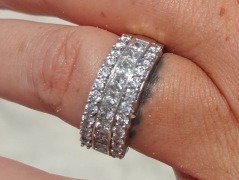 Due to the swelling she wasn’t able to wear her wedding ring anymore and being from the poor midwest, she felt awful not having her ring on and being pregnant. Despite their financial situation my father came home one day with a new, larger ring so she would have something to wear while she was pregnant. It wasn’t much but it meant the world to my mother! She decided while she was pregnant with me that one day she would give it to me or my spouse to wear when we were expecting our own. 33 years later, that day finally came. While she was visiting us for our baby shower in Orlando from the cold of Minnesota she brought the ring to give to my wife and to share that story with her. Heartbreakingly she never got the chance. The day she decided to give it to my wife we were all fishing off our dock in the canal. My mother was wearing the ring on her pinky finger and when she went to cast the rod–she dropped her precious ring of 33 years into the muddy water. Needless to say my mother was heartbroken– as was I for her! I searched in the water for an hour or two, to no avail, bringing up bucket after bucket of mud in a hopeless search. Meanwhile my wife was laughing at me–having no idea why in the world I would be in the water and having no idea about the ring or the family story. We did not find the ring and my mother flew home to Minnesota heart broken. 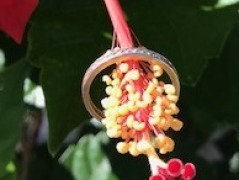 (A few weeks later she bought and mailed us a ring that looked similar, feeling it was all she could do.) I was determined to find that ring! In my search to figure out how to build a pump and dredge system to dredge and sift the mud, I found theringfinders.com while searching for “How to find a ring underwater.” I emailed Mike on a Friday morning and by that evening we had a time set for the following day. The next morning I explained to Mike how the ring had been lost 4 weeks prior and showed him the dock and where we thought it might be. He said a little prayer as he climbed down the ladder into the canal and began his search. About 20 minutes later we heard the wonderful buzzing of his metal detector, picking up a strong signal. A couple of muddy scoops later and with a huge grin on his face, he pulled the ring out of his muddy sifter. Mike was an amazing spirit and a blessing to come and find our lost ring. 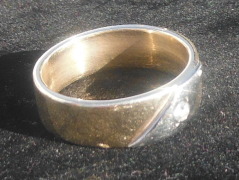 We had our baby just a few short days after finding the ring and I can’t wait to surprise my mother when she comes down to meet the baby and to find out we found her ring–the ring she had been holding for 33 years! So glad to help you Jared and congratulations on the birth of your precious little one! 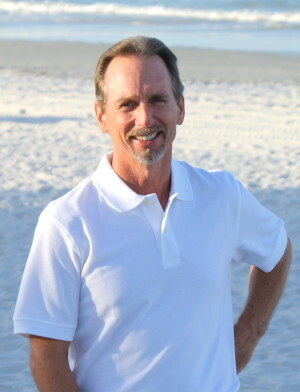 Mike McInroe–willing and ready to help you find your lost item!! Call or e-mail me ASAP! 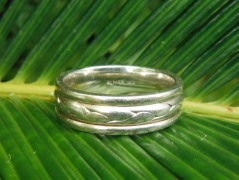 I am absolutely delighted by the service Mike McInroe/The Ring Finders offered! 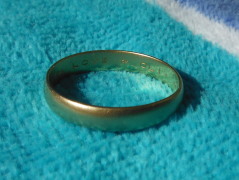 I lost my wedding ring whilst playing football (soccer) with my son on one of the beaches at the Disney Caribbean Resort. After spending hours looking for it on my own and getting nowhere, I did a web search to try to find someone with a metal detector who could help. Thankfully Mike McInroe was top of that search list. I sent him an email via his site and he got straight back to me and came over within a day. It quickly became clear that Mike was not leaving until that ring had been found, and sure enough after a couple of hours of methodical searching, there it was. The whole experience was rounded off with my kids, and then quite a few of the audience that had gathered, getting a free metal detector lesson and experience on the beach. An excellent service and a lovely person to do business with. Thanks again Mike. Iain Henderson and family --from Scotland! August, 2015 we were having a wonderful trip to Daytona Beach, Florida with the family. The weather was great. My 9 year old daughter has always wanted to learn to surf, so on Wednesday, August 5th I rented us a surf board to try out. She was doing really good and I decided to give it a go. I had fun. Only had one really big spill. 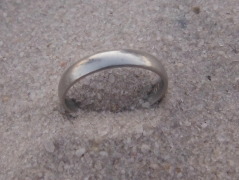 I walked up on the beach to rest a bit and I noticed that engagement ring was missing. I was upset. We looked up and down the beach and in the water as best as we could. I knew I had it on at one point while surfing. We checked everyone's pictures of me surfing and saw it on my finger until that last wipeout. The rest of that day and well into the night we searched. My brother-in-law has a metal detector and we used that. We met a retired Marine on the beach who does a lot of metal detecting. He gave us tips and even came out the next morning to help. Some guys at our hotel mentioned that there were people who did this for a living. 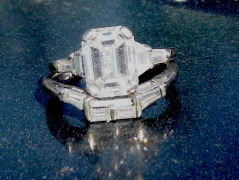 My fiancé researched some that night and found Ring Finders and 2 men who cover the Daytona area. The next morning we bought a metal detector and kept looking. For 2 more days we looked. On August 8th we had my brother-in-law, the retired Marine and us out on the beach looking. We were having no luck! My fiancé made the decision to call The Ring Finders and said everything said choose Mike McInroe! He was awesome on the phone and made us feel better. We couldn't believe that he only charged for gas money and a small reward IF he was successful!! He was at our hotel within 2 hours! He got suited up and told us not to get too excited every time he picked something up....we would know when he found the ring. He was so positive! We sat in the beach and watched. Within an hour he stood up and raised his hand!! Oh my!! I wish someone had had a video of me flying through the surf to get to him!! There were tears and hugs and laughter. I cannot say enough how wonderful The Ring Finders and especially Mike McInroe are! He gave me back something that is very precious to me!! I will never be able to truly repay him! Only two months left until my wedding day, I unfortunately dropped my engagement ring in the Atlantic Ocean. As I saw it slip out of my hand, I thought it was gone forever. After a brief search on the internet, my fiancé found Mike McInroe, a wonderful kind hearted man. I felt that Mike was the last hope that I could hold on to in finding my engagement ring. Mike came to Jacksonville the very next day to search for my missing ring! After a long search that day and as the tide came back in that later afternoon for the last time in daylight I felt like the search was over, I had finally lost hope. 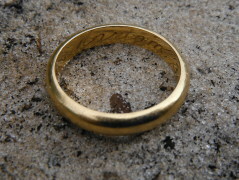 I parted with my ring at that very moment as I thought Mike had finished his search. To my surprise, Mike came to me and said that he was going to continue his search that evening until the tide went back out again. Mike was my knight in shining armor! At that very instant I felt so overwhelmed with joy that this man brought back hope to me in the most unselfish way possible.